Sterling Silver (925); Ladies - Size, rectangular, polished. Dimensions of the case: 30 mm (top-to-bottom including lugs) x 22 mm (diameter, not including the crown), thickness 5.5 mm. Circular-grained crown set with a spinele cabochon, sapphire crystal glass; back secured with eight screws, water-resistant to 3 atm. Two-layer dial. Background dial with Cartier logo pattern. Second layer with luminescent Arabic numerals and track-for-minutes in black. Blued sword-shaped hands in stainless steel. 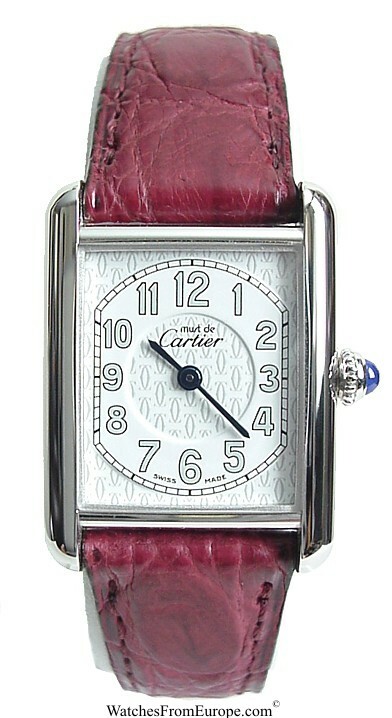 Original Cartier burgundy caiman leather band. Adjustable deployant clasp in stainless steel. ~ AS NEW - STORE DISPLAY MODEL ~ Grade 9.9. Store display model. No scratches, dents or marks. 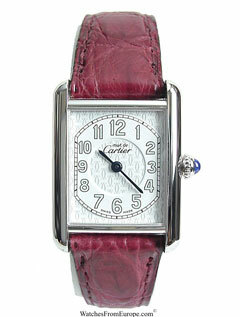 Original Cartier box, all papers & Cartier warranty. This is the name of which dreams are made. For more than a century and a half this legendary brand has been creating jewelry and timepieces in the most magnificent and enduring style. Using only the finest gems of the world, creating truly innovative designs, and crafting to the most exacting of standards, Cartier has become a standard of measure for most others in this industry.In 1847 Louis-François Cartier began creating elegant jewelry in his Parisian workshops. Commissioned by French royalty, he designed some of the most regal jewelry in history and quickly earned a French-court following. Over the century-plus since the first Cartier piece was designed, the brand has built a reputation for engineering some of the most exotic and unique jewelry in the world. We ship via FedEx 2nd day service within US. We pay the highest prices on all high-end Swiss watches.